The Jewish establishment has banned these four valiant Jews. Why? | Jews Say No: Not In Our Name! The Jewish establishment has banned these four valiant Jews. Why? This is the story of a tragedy inside the Jewish community. 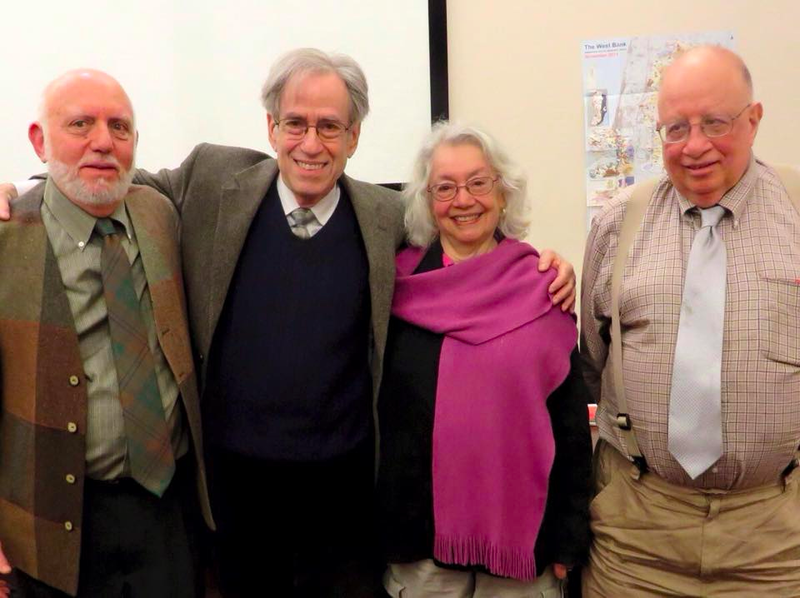 The four American Jews above are on a national campus tour. All in their 70s, they are veterans of the civil rights movement; they went south 50 years ago to help free our country from Jim Crow, risking their lives for equal rights. But they have been banned from speaking at Hillel, the Jewish campus organization, because they have come out in favor of Palestinian human rights. Last Wednesday they were to speak at Swarthmore Hillel, but the gangster who runs Hillel, former congressman Eric Fingerhut, hinted at legal action if the students dared to let them speak– so the students had to start a new Jewish group called Kehilah just to hear them. The next night they spoke to an overflow crowd at Muhlenberg College, introduced by former Hillel president Caroline Dorn. Dorn had to quit Hillel in order to host them—and she also had to meet with the college provost even to get permission for the four to come on campus because the college administration was afraid of alienating Jewish students. “It was devastating,” she says. And last night they spoke to more than 100 at the University of Michigan. Again: barred from Hillel. So these four travelers are freedom riders twice. First in their 20s in the civil rights movement, now in their 70s, sponsored by the Open Hillel movement. “Why are they so afraid about what a bunch of old folks are going to say to you?” Mark Levy asked at Swarthmore. Why? Because when I saw them at Swarthmore, three of them started to weep as they told their stories, even 50 years later. Why? Because they witnessed an American social revolution in which many people suffered, and they are extending that experience to Palestine. Levy is the man on the left. A retired teacher in New York, he went south because he thought the best way to fight anti-semitism was to fight discrimination against all people. Next to him is Larry Rubin. Rubin went south “automatically” from the Sholom Aleichem Club in Philadelphia 50 years ago because “I wanted to make my country better.” But in Belzoni Mississippi, a sheriff said to him, “We haven’t hanged us a Hebe in a long time” and the white people said he was trying to “destroy” the country. The same charge was hurled at him when he went to Palestine and witnessed the apartheid conditions there. On Zellner’s left is the baby of the group, Ira Grupper. He grew up Orthodox in Brooklyn, and twice he broke down last week as he spoke. First when he said that he had named his daughter after his friend Vernon Dahmer, who was murdered in Mississippi for helping black people to vote. The second time when he told of his arrest with hundreds of other men at the Mississippi Fairgrounds, and every night as a form of humiliation and control the cops served the white prisoners their bologna sandwich and cup of milk first but every prisoner set the cup on the floor with the sandwich on top of it till the last black prisoner was served. You’d think that these four Jews would be hallowed by the Jewish community, that Grupper would be telling his stories at the 92d Street Y and the DC JCC and the Center for Jewish History in New York. No: they are pariahs, because they speak out for Palestine, and cross Hillel International’s red lines for accepted speech. The night I saw them was tense. Joshua Wolfsun of Kehilah warned the crowd, you may disagree vehemently with what you are about to hear, but please try and listen resiliently and if you have to blow off steam, take a walk outside. A rabbi who sat near the back asked what was the difference between blind loyalty to Israel that the group was opposing and support for the Jewish people. An older man said equal rights and civil rights and peace are all great, but what do you owe the Jewish community? Rubin said the thought control reminds him of Communist days, when friends said he should never criticize the Soviet Union because Russia was the savior of the working class, and criticism would hurt the movement. Zellner said Israel is not a Jewish country, any more than the U.S. was a white country when 12 percent of the country was black. But she said the demands of Jewish nationalism have made Jews sick. She said the young Jews in the room were the “prize” that the older Jews are fighting over, and the Fingerhuts will lose. Others on this site are not as thrilled as I am by this movement. They say it’s fine for Jews to save the Jewish soul, but that’s not going to bring justice to Palestine. I say we need to change the Jewish community, because we hold the keys to changing U.S. policy. One thing we agree about, the Jewish community is reactionary when it comes to Palestinian rights; and these four Jews in their 70s are working with Jews in their teens and 20s to try and change that culture. Dorothy Zellner said the Jewish establishment miscalculated, promising its loyalty to Israel, saying, “We are all in lockstep. But we’re not.” The young people are breaking those chains and the Fingerhuts and Foxmans are terrified of the change. And when the change happens American public opinion will break. Hillel is facing a choice – it can continue to spend valuable resources devoted to fighting its own students in an attempt to dictate what students can and cannot say about Israel/Palestine, or it can return to its mission of engaging Jewish students. The vets will be at the University of Chicago on April 1st. We’ll announce additional stops on the midwest tour when we learn about them. And then they hit the South, April 15-18. This entry was posted on April 1, 2015 at 10:38 am and is filed under articles, Hillel, Israel, Kehilah, Open Hillel. You can follow any responses to this entry through the RSS 2.0 feed. Both comments and pings are currently closed.